This was our third Overbrook House wedding and it was wonderful. What I love about the Overbrook House is how each wedding can be as unique as the couple who plans the celebration. They’re all so personal and intimate – and tons of fun. As will happen sometimes – it rained on Lindsey & John’s wedding day. The rain and summer heat did not get them down at all. They rolled with it all – changing their ceremony location from outside to in, which created a cozy space for a very emotional ceremony. Then the celebrations continued under the tent – and back to the dance hall…for dancing! How much Lindsey & John were game to go out in the rain. Their photos show how the day actually was – which is real and great. The art Lindsey created that was tied in together on their welcome sign, invitation, and even bottles of wine. John practicing a song he had written for Lindsey before they did their first look – and then his performance during the reception. There was so much of Lindsey & John, and the life they’ve created together, infused in their day. That’s the way to do it. + $50 off mini-family sessions! Gift a session to family, friends, or better yet – yourself! We’ll be heading out to Western Mass this weekend to celebrate with Sara & Andrew at Quonquont Farm – almost exactly five years to the day we celebrated with Maura & Aidan in the same lovely place. A few weeks ago, in between their move from California to Connecticut, we met up with Sara & Andrew on the North Shore to hangout. We ended up with a beautiful sunset over the harbor in Marblehead. Crossing our fingers for another beautiful day on Sunday. And now, I’ll let Sara & Andrew tell you a bit about how they met. Andrew: We first met at a beach north of Boston called Phillips Beach. It’s located in the seaside town of Swampscott, where I grew up. We met the summer after we each had graduated from college. I moved-in with my parents while I waited for a sublet in Somerville and Sara moved in with her sister and her family in the town next door, Marblehead. We ended up at Phillips Beach due to our mutual friend Hannah, who’d invited each of us. Andrew went to Middle and High School with Hannah and Sara knew her throuigh college. Now Hannah is toasting us on our wedding day! Sara: I won’t be redundant since Andrew’s answer covers the details about how we met, so I will instead describe how we reconnected! Due to the complications of life, we went through a really painful breakup in 2012. I would make comments to my mom and sister every once in a while about how much I missed Andrew and thought we should be together; at first they didn’t take me seriously, but they finally urged me to get in contact with him if I felt so strongly. We spoke every once in a while over the next few years, but we were never in the right place at the right time about rekindling our relationship. We both moved away from Boston for graduate school. Andrew, What was it about Sara that first impressed you or caught your attention? Well….I’ll be honest and say that I can still remember the way she looked in her bathing suit. More so, I noticed her easy smile, the way the sun reflected off the water and lit up her eyes, and her playfulness and humor. Sara, What was it about Andrew that first impressed you or caught your attention? One of the first things that drew me to Andrew is his natural ability to take such good care of everybody around him. This manifests itself in many areas of life (including his career as a social worker), but I first noticed his love for hosting other people in his home. Andrew is an amazing cook and always invites people over for dinner. I think that this warmness is very emblematic of his values, and is one of the (many) reasons I can’t imagine spending my life with anybody else. What are you looking forward to the most about your wedding? Sara: When I think about our wedding day, I picture us under the chuppah holding hands, and looking out for the first time to all of our family and friends who have traveled to witness our commitment to each other. I think this will be such a beautiful moment and I get chills just thinking about it. This weekend we’re heading up to Maine for the second time this summer to celebrate with Carly & Alex. This is a special one for us. Two years ago we photographed the wedding of Greg and Julie, Carly’s sister, in the same place – Kamp Kohut. The summer camp has been run by Carly’s family for a couple of generations, and Carly is continuing in that tradition. Carly suggested us to her sister and Greg after being a guest at Karla & Todd‘s wedding, who we’ll also see this weekend. It will be quite the reunion for us! As I mentioned in my last post, one of the things I enjoy about my job is getting to know our couples – hearing about them individually, how they are together and how they met. I thought it would be fun to learn a little bit about each couple before their wedding day in their own words. We met in 2014 in Israel on Birthright, although we were both living in Boston at the time. It was an eight day trip during one of the more intense times over the last few years where the country was really on edge and preparing for an attack. It took about 3 days into the trip for us to actually start speaking with each other, but we hit it off right away. On the way back to JFK, Alex had asked for a ride back to Boston and was introduced to Carly’s parents before the 1st date even occurred. Alex and Carly’s dad Dan hit it off immediately, speaking for almost the entire 4.5 hour ride back while Hanna, Carly’s childhood friend, sat in the backseat telling Carly’s mom Lisa all about Alex. We are so lucky to have Hanna celebrating with us at our wedding and signing our Ketubah, and our friend Sarah, who we met on our trip and helped orchestrate the proposal, will be marrying us! Alex, What was it about Carly that first impressed you or caught your attention? She has an infectious smile and generous personality. I can always spot her in a crowd because her face lights up and she does this cute little head turn thing along with it. Carly, What was it about Alex that first impressed you or caught your attention? Alex’s eyes definitely caught my attention first (and that of the whole group as he was given the superlative of “Best Eyes” by the group!) but sadly so did his clothing choices. He wore these bright red swishy pants that can be seen in our first photo together. Unfortunately Alex still has them, but thankfully they don’t get worn very much anymore! We are most looking forward to celebrating with all of our favorite people being in our favorite place. We are sad to be missing a few key people in our lives but know they are here with us in their own way. We are so happy to be starting our married life together with all of these special people in this special place. Hello! It’s been a while. Engagement shoot and wedding season is here, so there are photos to share. To start though, this is a shoot I did with Becca & Nick back in December at the Middlesex Fells Reservation. What I remember most is laughing a lot, which just so happens to be one of my favorite things to do. On this muggy day in Boston, it’s funny to see snow on the ground and ice on the reservoir. One of my favorite parts about my job is meeting so many different people and hearing their stories – where they grew-up, their interests, and of course how each couple met. I thought it would be fun to get to know a bit about each couple before their wedding day in their own words. This is the first couple that I’m doing this with and Nick was kind enough to send his answers along when Becca was out of town. Without further adieu, I’ll let Nick take over. We actually met while doing research in Greenland. I was finishing up my PhD in Seattle, and was planning to join a lab a Woods Hole Oceanographic where Becca was getting her PhD. The scientist who ran the lab asked if I’d like to join them to collect some data in eastern Greenland in August 2013, and I said sure! So I flew out from Seattle to meet the lab (having not met any of them before) and Becca was among the group. We immediately loaded up a small ship with our science gear and headed out into the fjord for 2 intense weeks of data collection near the ice sheet. You live in really close quarters and work super long hours on these trips, so it was a pretty full-on first meeting experience! As I mentioned, I didn’t know anybody on this trip before I stepped off the plane, but I immediately felt a connection with Becca. Being on one of these research cruises stuck on a tiny boat for weeks you get to know people really fast, and I was super happy that Becca was there. We worked, ate, talked, hungout together during all our waking hours for the whole trip and by the end I knew she was really special. I had to go back to Seattle for a few months after Greenland, but knowing that Becca would be in Woods Hole made me really excited for a cross-country move! Both of us are incredibly excited for the wedding. We are really excited to get to celebrate our relationship with all our friends and family. I can’t speak for Becca, but I imagine her answer would be the same – that we are most excited to get all our friends and family – people spread out all around the world – together in one place for the weekend. We can’t wait! We can’t wait to celebrate with them either! Their wedding is later this month in Maine and we’re really looking forward to it. The evening before the last (right, the last?) snow storm in Boston we met up with Samantha & Josh for a stroll along the Charles River. After living in a couple of different cities, they’ve found their way back to the Boston area. Documenting this phase of their lives with the city as a backdrop seemed fitting. We also wanted to give them a little warm up in front of the camera because these two are getting married this Sunday! Looking forward to seeing Lesley & Courtney and Danielle & Jeff too! On Julia & Francis’ wedding day we awoke to overcast skies and the threat of a storm with super high winds…which never appeared. We’ll call it wedding luck! These two are the most easy going couple. We really enjoyed being around their family and friends too. Everyone was in the moment with them all day long. That’s all you need at a wedding really – support and connection from the people you love most in the world. And to have some fun dancing is always great too – especially when there’s zydeco music! They’re day went off without a hitch at The Dennis Inn thanks to the ladies of Cape Cod Celebrations. The lovely flowers were designed by Designers Touch Florals. The catering was by Treats Catering and the after dinner treats were by Cottage Street Bakery. Zydeco music for all that dancing was provided by The Revelers. After temperatures around 0º these last few weeks, today’s balmy 50ish degrees is reminding me of Spring. Which I will say, I’m not ready for yet. Give me a few more snowstorms and then I’ll be good to go. This weather did remind me though that warmer temperatures will be here in the Northeast sooner than I realize – and with it will come flowers and weddings. Kate & Jon’s wedding at Larz Anderson Auto Museum was last Spring. The weather held out for an emotional outdoor ceremony overlooking Boston. The reception was inside and we had plans to step out for sunset for just a few more photos. The toasts ran a bit long, as they often do. The large door of the museum was open while toasts were being made. I watched as an overcast sky gave way to the final moments of a gorgeous sunset. We ran outside just in time to see a double rainbow over the museum. That’s a great (and pretty) omen, I’d say. As you’ll see, Kate & Jon’s wedding was nothing if not filled with fun. Kate’s dad wrote and performed a song for her. I, of course, wasn’t very successful at holding back tears. There was tons of great dancing – and even a bit of karaoke thrown in too. Our past couple Lesley & Courtney make an appearance. For those keeping tabs, that’s twice last year! Congratulations, to (still) the newlyweds – Kate & Jon! One of my favorite seasons is upon us – oyster season! A couple of weekends ago we were hosting Peter’s cousin who mentioned she likes oysters, which meant we just had to go and get some. We went to Island Creek Oyster Bar in Kenmore. Sitting at the bar, looking at all the oyster farm paraphernalia, reminded me of this shoot we did a few years back. 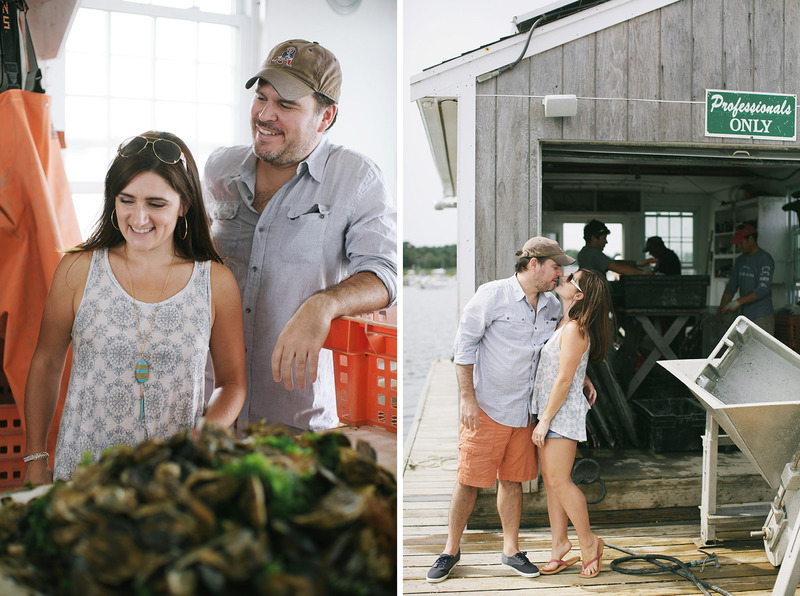 We met up with Melissa & Peter at Island Creek Oyster Farm in Duxbury. We were taken on a tour of the farm – starting out on ICO’s Oysterplex; then a tour of the area on a skiff with a stop by one of the beaches; and finally on the salt flats, where we dug up our very own oysters and shucked them right there…in our waders…with salt water and sand covering our hands. Such a fantastic experience! I would love to do more shoots like this one. Who’s up for putting waders on?! When I spoke with Kristie & Maclaine for the first time, they told me they envisioned an intimate wedding with a classic old New York feel. They wanted to have a meaningful ceremony officiated by very good friends, enjoy a great meal with their guests, and after dinner spend time chatting with everyone while jazz musicians played. Dancing could happen, but conversing with cocktails in hand would also be encouraged. At least that’s how I remember it. And if my memory serves correctly, then they pulled it off quite well! We carved out some time to make our way to Central Park – specifically A Tree House for Dreaming, which was in full bloom. We even popped back out to the street at dusk to get a little more of that city feel. These two really did it right. They focused on what was important to them, and let the day truly sink in moment by moment.